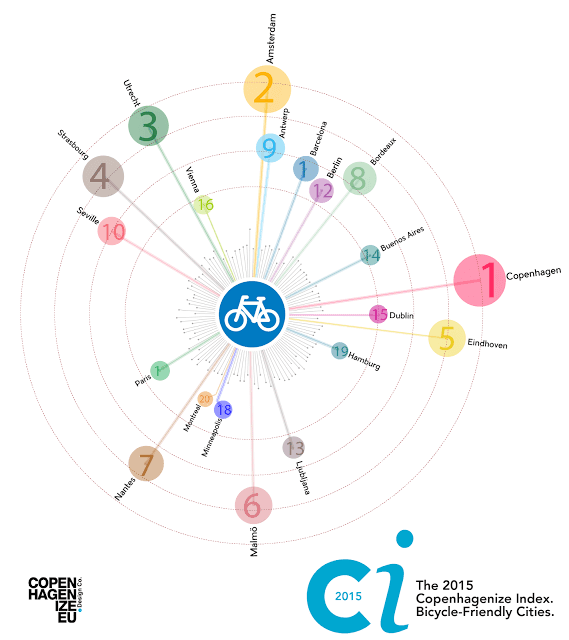 Last week Mikael Colville-Andersen revealed the results of the 2015 Copenhagenize Index of Bicycle Friendly Cities survey. It came as no surprise that the contenders for first place were friendly rivals Amsterdam and Copenhagen, with Copenhagen narrowly taking top spot and is was also not surprising that Tokyo which ranked 4th in 2011 and 12th in 2013 had disappeared from the index all together. But wait, isn't Tokyo the city where almost everyone cycles? Where the neighbourhoods are compact and well serviced making the bicycle the perfect mode of transport? Doesn't cycling hold a 16% share within the 23 Wards of Tokyo and 14% for the greater Tokyo area? Doesn't the bicycle complement Tokyo's highly efficient and convenient public transport network? Doesn't Tokyo have female cyclists in abundance, a feat many other cities just can't replicate? Yes these points are all true, yet Tokyo fell from the index. Why? I could tell you why, but instead I'll ask you: What has changed for cycling in Tokyo since the last Bike Index was compiled in 2013? In two years absolutely NOTHING has changed, nothing at all. Two years with no advancement shows that Tokyo has no political will to become a world class cycle friendly city and that is shameful. Tokyo Governor Yoichi Masuzoe has done nothing but pay lip service to cycling over that period, and none of his talk has been followed by action. In 2014 Masuzoe visited Mayor Boris Johnson in London after which he praised the Mayors efforts to promote cycling and provide safe infrastructure in the lead up to the 2012 Olympic Games even while cyclists on London's roads were being killed by lorries at a criminal rate. Upon arrival back in Japan Masuzoe promised cycling infrastructure for the Olympics using London as a model at which point it became clearly obvious that the Governor had no commitment to cycling, Only commitment to the Olympic games. Someone should buy the governor a ticket to Amsterdam or Copenhagen before he runs off to New York for inspiration. Oh wait, the Tokyo Metropolitan Government did that in 2014, inviting representatives from Bike New York to speak at a members only cycling summit and take part in an organised ride consisting of nothing but Lycra clad recreational cyclists. It seems if your city has implemented a successful bicycle sharing system and throws around words like "cycle superhighway" Tokyo wants to follow your example. The Metropolitan Government doesn't realise it has to do nothing to promote cycling as the Tokyo's citizens already cycle at much higher rates than cities like New York and London and that the solutions for Tokyo's cycling problems will come not from there, but from Northern European cities with high cycling populations. Just last month the Governor revealed plans for 400km of safe cycling routes around the city, where "around the city" is defined as "around future Olympic venues" and safe cycling routes are defined as sharrows, painted bicycle lanes and sidewalks shared with pedestrians. This once again demonstrated absolutely no political will to improve the city for cyclists and cycling, rather its just another weak attempt to try and convince the world that Tokyo is putting in the effort to become cycle friendly. It most certainly is not. Finally just this month harsh new penalties came into play for cyclists who disobey the rules of the road with police revealing a list of 14 confusing cycling misdemeanours if broken twice within three years could see a cyclist forced to attend a 3 hour cycle training course at their own expense or face a ¥50,000 fine. So in the past two years Tokyo's Governor has made noises about improving infrastructure, has gone to all the wrong sources seeking advice, has promised "safe cycling routes", not safe cycling infrastructure in locations where they are not needed, and has overseen the implementation of harsh new penalties for cyclists. Is it any wonder Tokyo is no longer among the top 20 bicycle friendly cities? Cycling Saves Money. Cycling saves the municipalities of the Capital Region of Denmark roughly DKK 1.5 billion a year. Whats more cycling generates an additional DKK 1.5 billion in tax revenues for the state and municipalities. 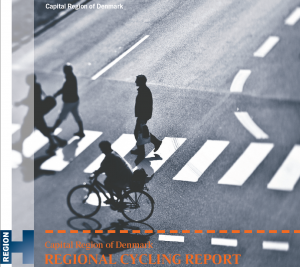 The Capital Region of Denmark Regional Cycling Report, being a mere 22 pages long, states the case for better cycling infrastructure and outlines the advantages in language anyone can understand yet nobody in Tokyo is reading? The report contains such gems as "Each time someone cycles 12,000 kilometres he or she reduces the average number of sick days by 1" and that the Capital Region experiences 1 million fewer sick days due to the effect of cycling. Cycling reduces traffic congestion which in turn saves time and as time is money DKK 0.8 billion is saved due to a decrease in congestion alone. Just last week Prime Miniser promised to cut greenhouse gas emissions by 26% yet did not reveal how he aimed to achieve that figure. Yet another verbal promise and lacking substance from a Japanese politician while The Danes, already active in the area, report that each time they increase cycling by 1 percentage point they see a 16,000 tonne reduction in greenhouse gasses, yet despite this there is no political will to promote cycling as transport in Japan. It is plainly obvious that investments in cycling infrastructure, cheap in comparison to infrastructure for other vehicles, pay for themselves multiple times over with solid economic benefits, the only kind of benefits politicians care about. The research has been done, the facts can't be disputed, yet still we have no commitment from our leaders. Seriously when among Japan's biggest exporters are Toyota, Nissan and Mazda can we really expect our government to promote cycling?? I've strayed a long way from the point, but in short cycling brings so many advantages to a city and it is the governors job to improve the city. Tokyo Governor Yoichi Masuzoe speaks often about cycling in the city but in the past two years has not backed up a single word with a positive action. Two years of inactivity from the Tokyo Metropolitan Government is exactly why Tokyo no longer features among the top 20 bicycle friendly cities. In the face of hard work and commitment of other cities that have a vision and are committed to positive change and improving the lives and welfare of their citizens Tokyo never stood a chance.